The study of Aztec gods and Aztec religion has been the subject of a lot of speculation and misinformation. The sacrifices performed by Mexica priests at the Pyramids of the Sun and Moon are legendary. However, there's more to Aztec religion than just blood, though many of their rituals were bloody. Here's a look at some of the major Aztec gods in the pantheon and their significance in Aztec religion. The pantheon (numerous gods) of the Aztec civilization was enormous, with hundreds of gods and goddesses worshipped. Many of these gods were agricultural, since the culture relied heavily on farming. Elements of nature, heroes, and ancestors were also revered. It was believed that the balance of the natural world and the destiny of humanity depended on these gods, some of which were benevolent, and others of which were insatiable and terrifying. The Aztec gods didn't all come from the same source. Many different cultures made up the empire, so their gods were frequently adopted and either added to the descriptions of existing gods, or simply put into the pantheon. Huitzilopochtli, for instance, was a Mexica god (the Mexicas being the people who founded what is commonly called the Aztec empire), while the traditions of existing cultures were adopted into a series of creation myths. 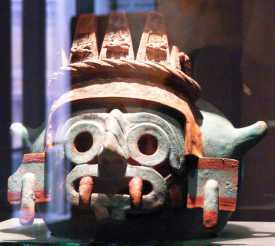 The Toltecs were considered the origin of all culture, and the Aztecs adopted a great deal from them. Ometecuhtli and his female counterpart, Omecihuatl, represented the primordial forces of nature and duality, and were the parents of many of the other major gods. Sometimes they are called husband and wife, but they were really considered two sides of the same dualistic god. They were sometimes shown as a half man, half woman figure. Read more about this god in the Aztec creation story. Quetzalcoatl was an important deity, since he had been the creator of humans. However, he wasn't the first to create them. The world had been created four times before, and destroyed by infighting each time. 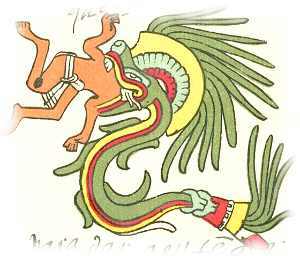 Quetzalcoatl retrieved the bones of humans from the underworld and added his blood to bring them to life. This god was represented by a feathered serpent, and can be seen in many different carvings and paintings. This is only one variation of the creation story. Here's another version of the story of Aztec religion, with a picture of a common image of Quetzalcoatl, on of the more important Aztec gods. Interestingly, it was believed that Quetzalcoatl introduced cocoa beans to humans. Huitzilopochtli (Hummingbird of the South/Left) was a warrior sun god, requiring blood sacrifice to help him win the battle against darkness (more about Aztec sun gods here). This was not always in the form of human sacrifice - sometimes ritual blood letting was used. However, sacrificed warriors were thought to rise and fight with Huitzilopochtli, so sacrifices increased in frequency. Battles were sometimes fought for the sole purpose of capturing more sacrifices. These battles were called flower wars. 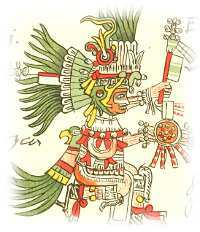 Huitzilopochtli was the great god of the Aztecs. His worship fuelled the battles and sacrifices of the people, and his temples were built in the hearts of cities. The Templo Mayor contained his temple, and his image was on Moctezuma's Throne. 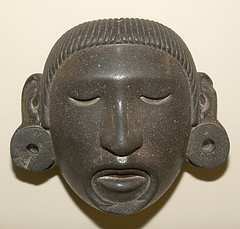 See a mask representing Xipe Totec. Photo courtesy of Neil Alejandro. There was a surprising find related to Tlaloc and child sacrifice at the Cholula Pyramid - read more. Read more about the sun gods here and also in the creation story. See more Aztec gods with pictures here.